A sequel to the 2017 surprise spy action-comedy hit 'KINGSMAN: THE SECRET SERVICE'; which was based on the 'Kingsman' comic book series, created by Mark Millar and Dave Gibbons. The film was once again directed by Matthew Vaughn, and written by Vaughn and Jane Goldman (the duo have co-written six screenplays together now). Original cast members Taron Egerton, Colin Firth (who's character presumably died in the original film), Mark Strong, Edward Holcroft and Sophie Cookson all reprise their roles in this sequel; while newcomers Julianne Moore, Pedro Pascal, Halle Berry, Hanna Alstrom, Channing Tatum, Jeff Bridges, Bruce Greewood, Emily Watson, and Elton John all join the cast. The story, this time, revolves around the Kingsmen having to team up with a similar team of American spies, in order to take on a new enemy in London. The movie has received mixed (to negative) reviews from critics (unlike the highly praised original), but it is expected to be another hit at the Box Office still though. Being a fan of the original, as well as Vaughn's other films, I was severely disappointed with this movie. The film takes place one year after the events of the original movie, when Eggsy Unwin (Egerton) is now the Kingsman's top operative, and he's also living with Princess Tilde (Alstrom) of Sweden. 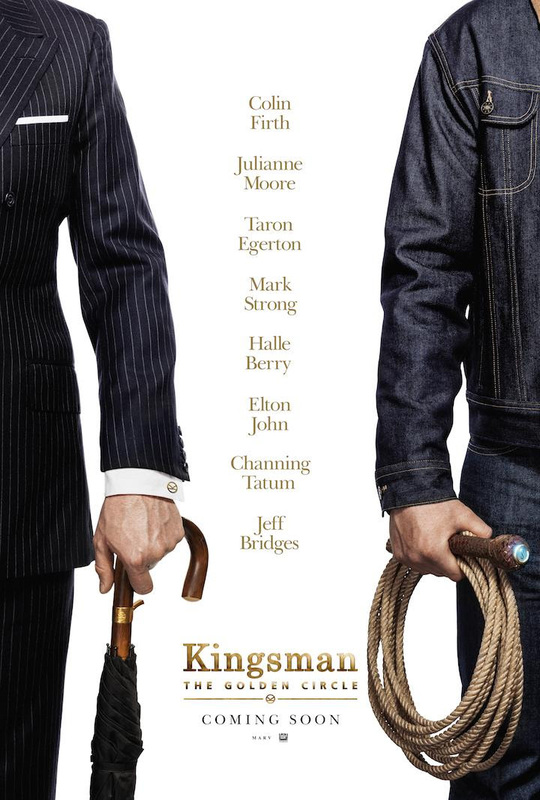 When all of the other Kingsmen are taken out in a missile attack, from a new enemy in London (called The Golden Circle), Unwin and Merlin (Strong) travel to Kentucky to meet their American counterparts (called The Statesman). They learn that The Golden Circle, lead by Poppy Adams (Moore), has laced every recreational drug with a deadly toxin. Adams demands that the President of the United States (Greenwood) ends his war on drugs, in order for her to release the antidote that can cure everyone. The British and American agents must team together in order to save millions. The movie is bigger than the original, in almost every way, including a much bigger cast of celebrities and even more over-the-top action scenes. Still, despite all of this, the movie feels so much smaller in comparison, for what it's able to accomplish. Some of it is fun, but it's mostly just a big mess, and I was bored for most of it's extremely excessive 2 hours and 21 minutes running length. Seeing as how Vaughn and Goldman have produced much better films together, in the past, this movie was a big disappointment for me. The action scenes are boring, a lot of the humor is humorless, and the celebrities are often more of a distraction than an actual addition of talent. I sure hope the next 'KINGSMAN' movie is a lot better.